It's an effects showcase too, though there are limitations. Alpha effects for airship boosters, and also gunfire, are rendered at full resolution here on each platform. But much like the beta release, the lack of reflections for projectile effects - such as laser fire - stands out during shoot-outs over damp marshlands. Global reflections are in place for surrounding geometry, however, and all lighting and characters (save for defeated enemy ragdolls) are mirrored at a full 30fps refresh. 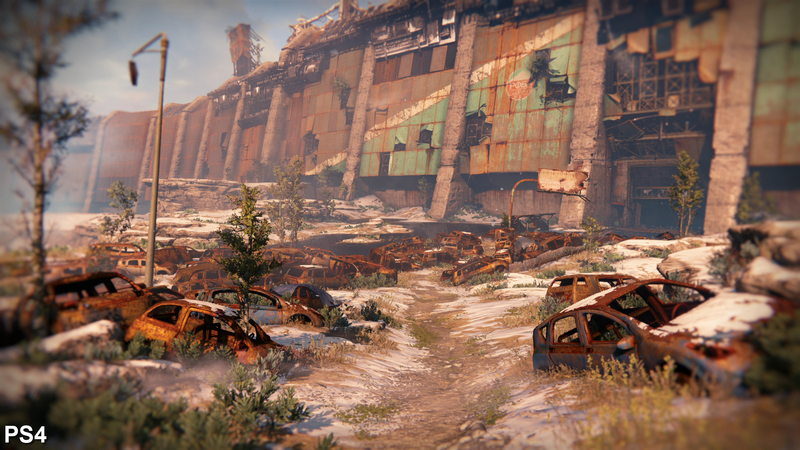 Destiny's full retail release compared on PS4 and Xbox One. Click on the 1080p button below to see the comparison at its best. All this serves to make Destiny's world feel consistent, and despite certain concessions it pays off handsomely. 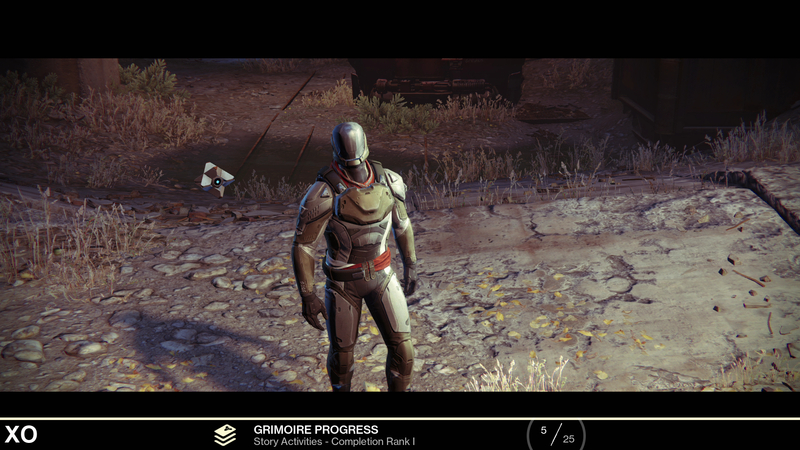 That said, one frustration with Bungie's always-online setup is the patience needed when starting up a new level. Put to the timer, we record a 58-second wait to reach the Tower hub area on Xbox One, tipping the PS4 to the punch with its one minute and one second wait. 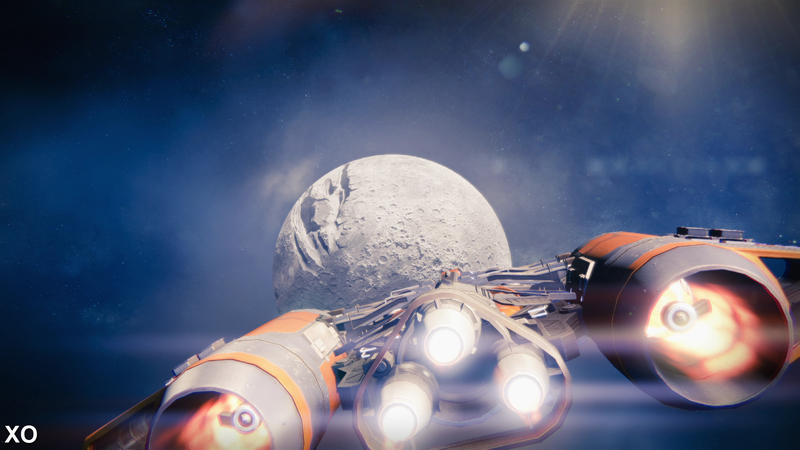 As a second test, we load campaign mission The Warmind, which proves to be a speedier experience overall. Here the Xbox One plants us in the Steppes area after 37 seconds, while the PS4 makes it in an ever-so-slightly nippier 36 seconds. While there are plenty of variables unaccounted for here (such as the undoubtedly high server load for Destiny's launch week), a marked advantage in loading speeds isn't necessarily up for grabs on either console - it's an equal test of patience on each. On the Sony side, little has changed to the PS4's accomplished visual setup since its beta phase. The game's presentation is a complete match with the current Xbox One build too, where both play at 1080p with FXAA anti-aliasing in place. In the end, the search for any variance between the two platforms moves us into the area of performance analysis - where the Xbox One has already shown a convincing handle on Destiny's target 30fps with v-sync engaged. The Old Russia's big, open expanses of terrain have Destiny running at like-for-like detail settings on both PS4 and Xbox One. Shadow maps pop-in based on the player's proximity - typically on foliage - but these LOD switches occur at the same distance on either platform. The game's post-process effects bring out an almost photographic quality in the image. 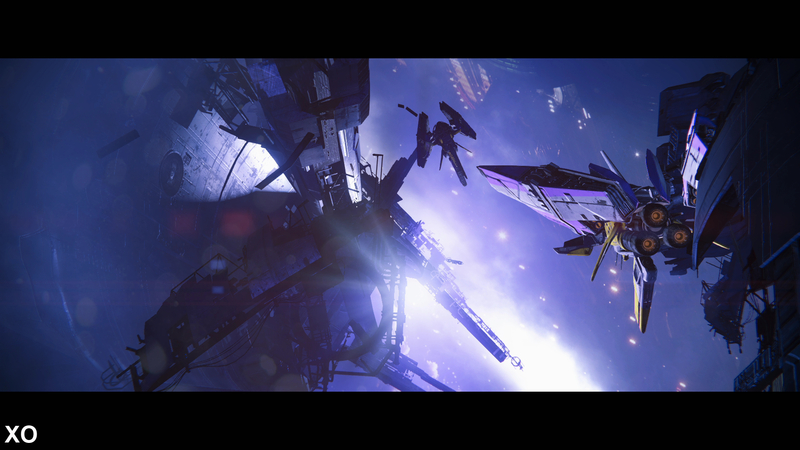 Here we have depth of field (DOF) in effect as the ship passes near the screen, while its jets produce wide anamorphic lens flares. Even on lunar missions the time of day is simulated. Matching the lighting up between the PS4 and Xbox One, there are only minor differences in shadow placement across distant rocks. Foliage elements are much clearer on Xbox One now, owing to its 1080p resolution upgrade. In terms of image quality, the two versions at last sit side by side. Normal map quality for underfoot terrain is equivalent on both PS4 and Xbox One - though these share a weak texture filtering method. Given the full 1080p outputs on each, the blurring to distant floor textures is much easier to notice. Moving across to the PVP multiplayer, geometry detail holds up on both consoles, right down to the ridged, bump-mapped surface of the canyon at the top of this shot. 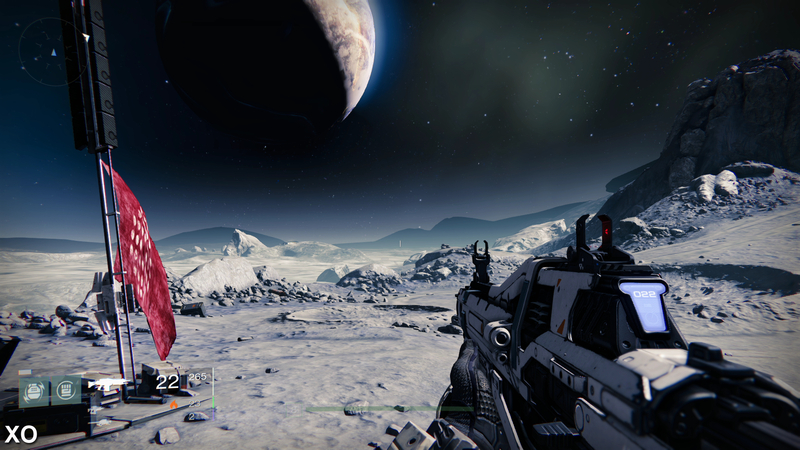 Bungie's lighting is completely dynamic, and comes with a suite of visual tricks. The crepuscular rays (or light shafts) shown here counting as a high point. Character model detail is consistent too, with the Xbox One release holding its own despite a massive resolution boost. It's the same story on PS4, where we encounter just one dip southwards during testing - a stutter around the Steppes wastelands while travelling on a Sparrow. It's a streaming hiccup also caught on the Xbox One version, pinpointed to a specific bend as we broach a new area. It's a rare blip common to both platforms, and otherwise Sony's hardware puts out a near-perfect 30fps line in the campaign. However, the Xbox One version still suffers from similar frame-pacing issues originally encountered in the beta. Microsoft's hardware averages at a 30fps output but the ordering of its frames is uneven, causing certain stages to feel less smooth as a result. The Dark Beyond mission, for example, has single frames dropped and added while enemies swarm out of a temple in our tests, causing a jittering sensation, while PS4 remains entirely consistent with a 33ms render-time per frame. In the very same mission and spot, the PS4 version shows no issues whatsoever. It's a similar scenario for multiplayer sessions; the Xbox One is clearly capable of rendering at 30fps, but with a different setup to PS4 that results in occasional bouts of uneven frames. It's a small shortcoming given how closely it matches the PS4 in every other regard, but curious nonetheless. It's most apparent in the Rusted Land stage, where the cause for the frame-rate fluctuation isn't quite clear. Despite the Xbox One's resolution boost, it's difficult to pin the blame on the GPU here bearing in mind that there is still the same 30fps average overall. 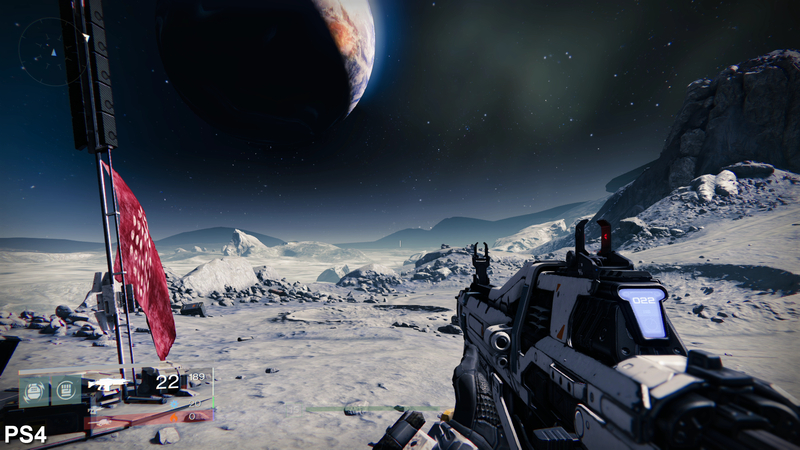 A strenuous performance analysis of Destiny reveals a strict 30fps average for both PS4 and Xbox One. However, Microsoft's platform suffers to a greater extent from frame-pacing stutters, whereas Sony's hardware has relatively few issues. As such, what we're looking at isn't exactly a deal-breaker for Xbox One owners - more a minor annoyance that we thought was fixed during the beta phase. Indeed, the way we see it, the most noticeable advantage PS4 has isn't really technology-based - it's all about the content. Exclusive to PS3 and PS4 is a slew of extras - the most significant of which concerns the maps. 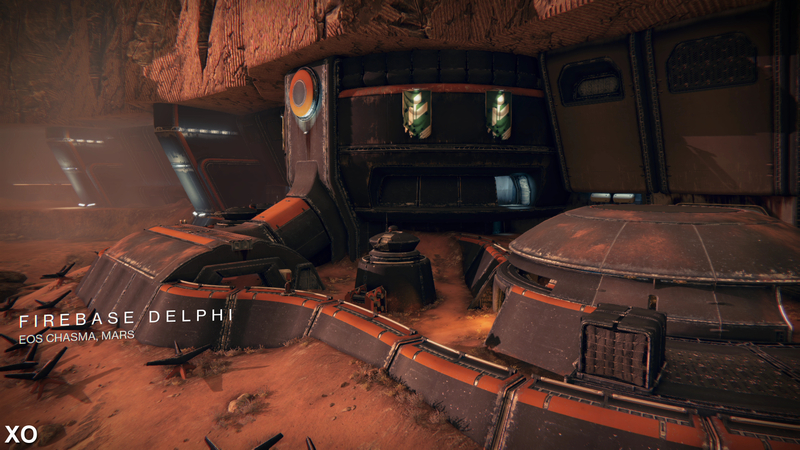 For the Crucible mode, a medium-sized Exodus Blue level is added to multiplayer map rotation. It's similar in design to the existing Rusted Lands stage, with close-quarters action forced by a tight-knit sprawl of abandoned vehicles and warehouses. Added to that is a co-op Strike mission for the regular campaign. Set on Mars, it's designed for levels 15 and up, involving a battle of attrition that took us well over 20 minutes to wrap up. Three exclusive ship designs are also added to Sony's platforms, while each class receives its own unique armour, carrying advantages based on enemy type. Two extra weapons are also added; the hip-firing Monte Carlo assault rifle and a Hawkmoon handgun with an option for a damage boost upgrade. To cut a long story short, it's safe to say that PS4 has a marginal technological advantage over its Xbox One counterpart, but for most people, it'll be the extra content that counts. With few technical differences to distinguish it from Xbox One, the PS4 offers some tantalising exclusive extras. Here we analyse the added multiplayer map Exodus Blue, and also the Dust Palace strike mission. Bungie strikes out to achieve technical parity between Sony and Microsoft's platforms and to a great extent achieves it. Visually, we're looking at the same image either side here, only divided by the vagaries of its dynamic time-of-day system, causing minor shifts in shadows during comparison. But right up to Mars' sweeping dunes, both PS4 and Xbox One owners are being treated to the same crusade across the galaxy, with every LOD parameter, texture and effect intact. Xbox One's frame-pacing issue is a minor annoyance, but far from a deal-breaker. Each platform holds at 30fps comfortably - the only drawback on Xbox One being its uneven spread of frames at certain points, causing a stutter sensation. 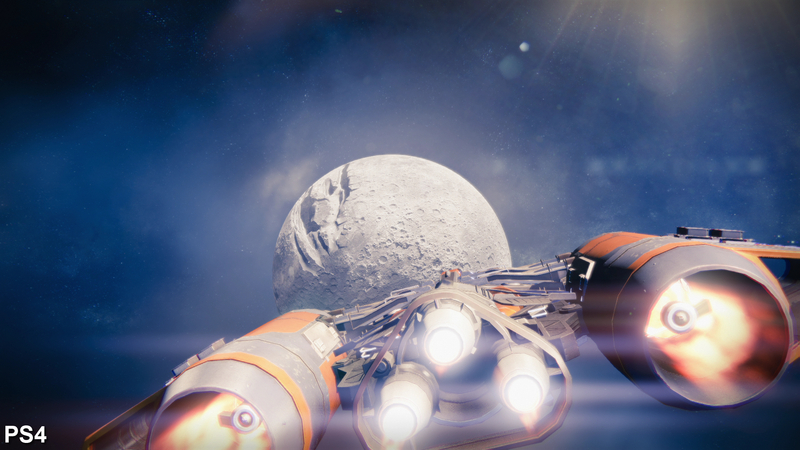 Those who played the PS4 beta will recall the issue, prior to Bungie nipping it in the bud with a patch midway through. What we're left with on Sony's platform is a nigh-on perfect 30fps playthrough, with each frame consistently being rendered in the correct order. In the final comparison, it's surprisingly close. 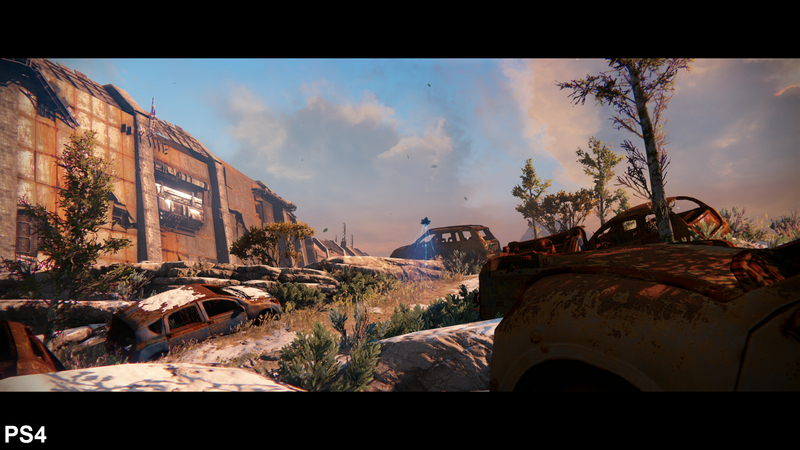 Putting aside Destiny's technical faculties, there are content differences to consider between the two. The PS4 adds a handful of compelling extras, spanning class-specific armour, two unique weapons and also entirely new stages - such as the Exodus Blue multiplayer map and a Dust Palace co-op mission. With the very functional Vita Remote Play mode added to the mix too, the PS4 undoubtedly has more going in its favour in terms of luxurious extras. For those lucky enough to own both consoles though, the advantage lies on Sony's platform - but only by a whisker, with the core experience on Xbox One being just as worthwhile overall. 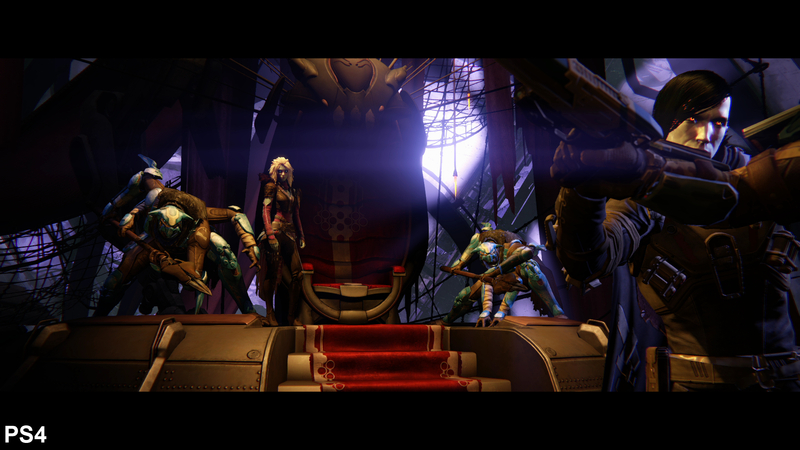 Struggling with Destiny's end-game raiding? Don't miss our essential Crota's End guide. How to complete each Challenge Mode introduced in the Rise of Iron Raid. Our complete walkthrough to tackling Rise of Iron's challenging Raid.